So soothing it almost plays itself. 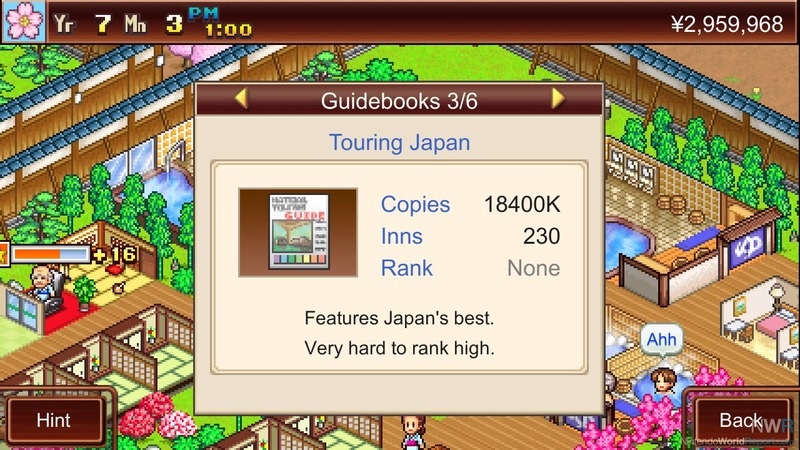 Kairosoft’s Game Dev Story was an enjoyable experience for me when I first played it on PC a few years ago. So when I heard that title along with Hot Springs Story were heading to the Switch, I thought it would be a great idea to check out the latter. Playing it on the Switch made it clear that this is a port of a mobile game from many years ago. That’s not necessarily a bad thing, but at the same time there’s nothing really all that remarkable about Hot Springs Story. 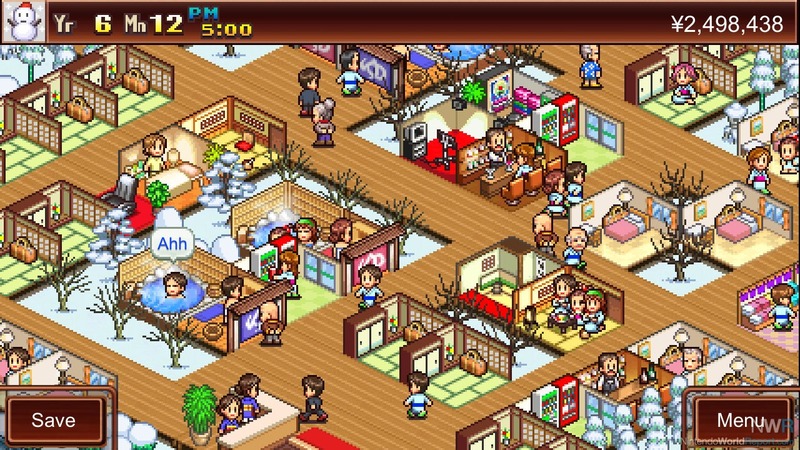 As the name would suggest, Hot Springs Story is a management sim where you gain control of a Japanese-style spa, with the goal being to bring in as many clients as possible. You do that by targeting certain demographics that you set, then arrange items (preferably those with high compatibility) to cater to those audiences. The more investments you secure and put money into, more items and demographics will unlock. Another goal is to get the top rank of each guide book that becomes available to you, which also unlocks more client types. I found Hot Springs Story’s aesthetic to be quite charming. The 16-bit esque sprites are colorful and vibrant, though they do get a bit repetitive. The music is also fine, but grating after a while as there’s only really two songs in the entire game. Obviously there are problems with the presentation here; after all, this is a port of a cell phone game that came out in 2011. The charm still manages to shine through regardless. There are strategic elements to the game that kept me playing, but really there’s not a whole lot to Hot Springs Story. There were plenty of times during gameplay where I’d often just multitask and let Hot Springs Story play itself for a few minutes until a new investment or other opportunity popped up. I didn’t mind this too much, but if you were to ask me if there was any real challenge to Hot Springs Story aside from upping your clear ranking after each play, I’d say no. Hot Springs Story is thoroughly average for 2018. On one had, it’s an easygoing, simple game that kept me entertained for a while. But it’s not particularly difficult, and there were plenty of moments during gameplay where I just people watched instead of playing or really doing anything of note. I think this is good for people who want something to do and enjoy while being occupied with other matters, but otherwise there really isn’t much to say here other than it was a nice looking game that was fun for a while.